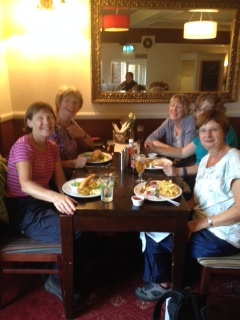 Unfortunately the forecast for the Hogsmill walk was bad weather but the five members who did face the elements had a lovely walk (and talk) stopping half way for coffee and later, after walking 5 miles, for a pub lunch in Berrylands. A few of us went on to complete the walk which finished in Kingston where the Hogsmill joins the Thames. In all it was a 7 mile walk and, of course, towards the end the weather cheered up and the sun was almost shining! The total walk was approximately 6 miles. 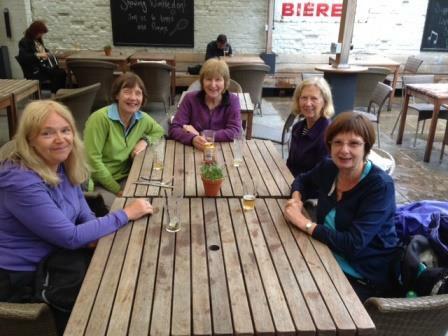 We managed to avoid a couple of showers by visiting a few hostelries – one at the Roehampton Gate Cafe for a coffee break and another at the end at the Coat and Badge Pub, Putney for a well deserved drink and lunch before catching the 93 bus back to Wimbledon.